Gamblogger: RTG's New Gemtopia Slot -- Get 50 Free Spins at Slotastic! 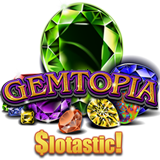 RTG's New Gemtopia Slot -- Get 50 Free Spins at Slotastic! The dazzling new Gemtopia slot game from Realtime Gaming is coming to Slotastic on Monday. The popular online casino will give you 50 free spins to try the glittering new game tthat has an Expanding Wild Re-Spin feature and free spins with bonus picks. You can get another 44 free spins if you claim the special Gemtopia introductory deposit bonus! Gemtopia has two free spins bonus features. Free spins are triggered whenever the Wild gem appears, and expands to fill all three rows on its reel. The expanded Wild is held in place during the bonus spin. Wilds that appear during the bonus spin trigger more bonus spins. Free spins are also initiated by Free Games symbols on the three middle reels. If three Bonus Gems appear during a free spin, you can click on them to reveal prizes of up to 1000X your bet. Introductory bonuses and free spins available until August 31, 2017. Available to all players that have made a prior deposit in August. These bonuses are available until August 31, 2017 only. Gemtopia will be available in Slotastic’s online casino for desktop and laptop computers as well as its newly re-designed mobile casino for smartphones and tablets.